There are a lot of people who do not realise that you can claim compensation when you are a passenger in a car accident. If you have been injured as a result of the accident which was caused by the negligence of another road user or pedestrian, you have the basis for a claim. There are a lot of different reasons why car accidents which injure drivers and passengers occur. Human error is the major contributing factor to these accidents, even with the progress which has been made in road safety. In these cases, the car passenger could claim compensation for the injuries they sustain. Drivers tend to be at fault in most cases of road traffic accidents and this could be the driver of the passenger’s car or another driver. There are some situations where more than 1 driver could be at fault. In these cases, all of the partially responsible parties will be liable for a share of the compensation the passenger is due. A variety of highways and byways are the responsibility of the local authorities. Main roads and other significant roads will generally be the responsibility of the national authorities, but both of these authorities will be in charge of the safety of motorists and pedestrians. This is important because there are times when road conditions such as potholes have been reported to the authorities and repairs have not yet been carried out. If an injury is sustained due to this, the authority in charge of the road will be legally liable for the compensation. There are often occasions where a pedestrian steps onto the road and causes drivers to swerve which can result in injuries and fatal accidents. While a lot of emphases is placed on drivers regarding road safety, pedestrians also have an obligation to ensure the safety of others. If a pedestrian is found to be at fault for an accident which causes injury to a passenger, they may be forced to pay compensation. All drivers will have a legal responsibility to ensure that their passengers are safe in relation to their actions and driving. However, they also have a legal responsibility to ensure that the passenger is suitably retrained. If there are minors in the car and they are injured in an accident because they did not have the appropriate restraints, the driver is legally responsible. If a passenger is injured in a case where faulty equipment is at least partially responsible such as the vehicle, the airbag or the seat belt, the manufacturer of the item can be pursued for compensation. If the manufacturer is aware of the issue and failed to act on this, there could be cause for further legal action. There are times when more than 1 party will be responsible for the accident and the resulting injuries faced by the passengers. There are also situations where the injured passenger is partially responsible such as their failure to use the seat belt or restraints and this led to an injury. In these cases, the courts will generally use contributory negligence as the basis for reducing the compensation paid by the other negligent parties. 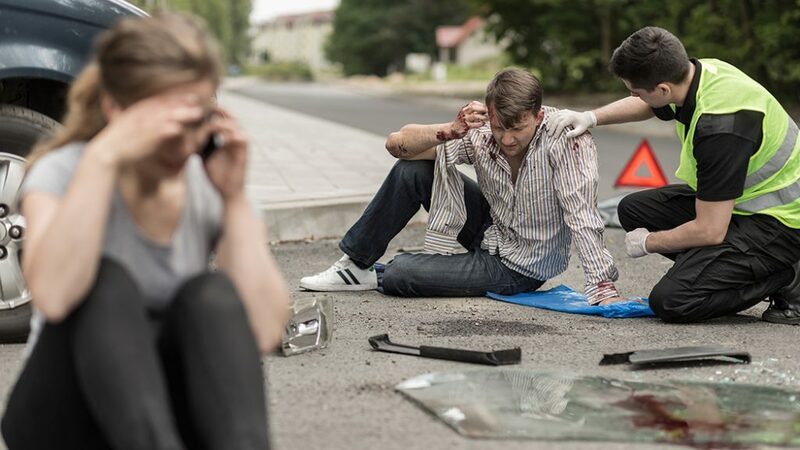 The type and severity of an injury suffered by a passenger in a car accident can vary greatly, there are some injuries which are more common than others. When looking at compensation, the general damages are awarded based on the pain and suffering as well as the life-changing injuries received. Special damages will often involve the financial redress of any lost income and the expenses which can be associated with the injuries suffered. If you have been injured, you need to know who is at fault for the injuries you have sustained. Medical attention will need to be sought as soon as possible to ensure that there are no complications. This will also ensure that your medical records are up to date with the details of the car accident, the injuries sustained and any treatment you receive. This can be useful in court when you are pursuing your claim. You also need to gather as much evidence as possible to prove negligence and fault for the accident. This will include pictures of the location and the vehicles involved. You also need insurance details of all parties, eyewitness statements, dash cam recordings and CCTV coverage. A car accident solicitor will have a lot of experience in pursuing general and special damages related to accidents involving passengers. If you contact a solicitor for advice, they will be able to discuss everything with you. You will need to talk about what happened and will be asked for any evidence that you have. If the solicitor takes your case, they will generally do so on a no win no fee payment basis. Before you agree to anything, you need to find out more about the payment basis that they are using. This will generally mean that you do not have to pay the solicitor unless you win your claim. However, there are some solicitors that have clauses in their agreements which could result in you being liable for some payment. After signing an agreement with the solicitor, details of your claim will be filed with the courts and a copy will be sent to the defendant. In most cases, the defendant will look at settling the case outside of the courts. If the negligence claim is rejected by the defendant or there are multiple defendants, the claim may go to the courts. There a judge will hear all of the evidence about the car accident, the claim and the proof of negligence before delivering a ruling. The ruling will confirm who is negligent as well as the amount of compensation which is due, if any is found to be due.